show of their short-lived 2018 tour together. Since the two headliners toured along with Mitski in 2016, they have garnered a passionate, dedicated group of fans who seem to trek out to their shows, again and again, becoming a group that seems as close-knit of friends as Zauner and Duarte appear to be. 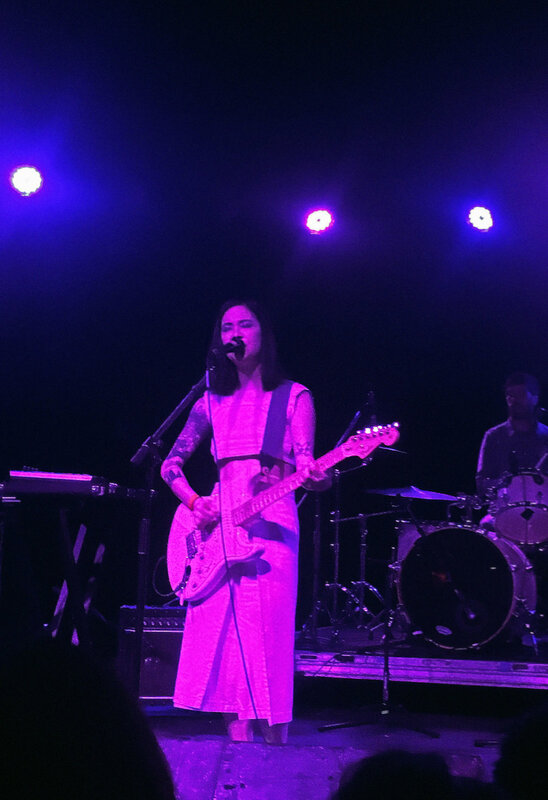 along with their other frequent tour mates and friends, Mitski, and Sasami Ashworth (previously of Cherry Glazerr), is that their unintended yet obvious representation of Asian women in the indie music scene, which until recently was majorly dominated by white men, attracts a certain crowd. Along with myself, the friends I attended the show with, and others I recognized from attending other Japanese Breakfast and Jay Som performances in LA, I noticed that the crowd was filled with young, excited, Asian American kids who saw themselves represented on stage and found within the music some kind of profound relatability. ensemble she has worn at each of her performances in the past year, almost as if “JBrekkie” is an alter ego of Zauner in which she vocalizes in autotune and sings songs about “falling in love with a robot” (her closer, “Machinist”). She faces the crowd, holds out her hand to the audience, and jumps excitedly to each one of her self-proclaimed bangers – yet she also expressed that she felt her music, lyrically, is filled with her own complex emotion, saying she felt “it’s so special when a large group of people come together and feel something together”. This really came to light during a song she wrote while grieving for her late mother, “Till Death”, when the audience stayed silent in respect for her vulnerability and authenticity in her performance. pitched voice as she fell into his arms, off the stage and alongside the crowd who screamed and cheered her on. The adrenaline, spontaneity, and passion for that performance, at that moment, was found somewhere within everyone in the room. We were in complete support of each other – which is why I’ll continue to follow Jay Som and Japanese Breakfast as musicians and role models wholeheartedly, along with, I presume, every other hyped up Asian kid in the crowd that night.